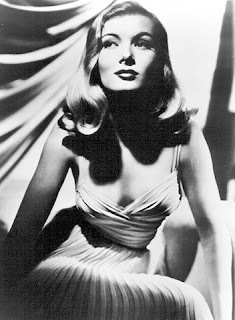 This is what I think of when I'm talking about a 40's hairstyle. 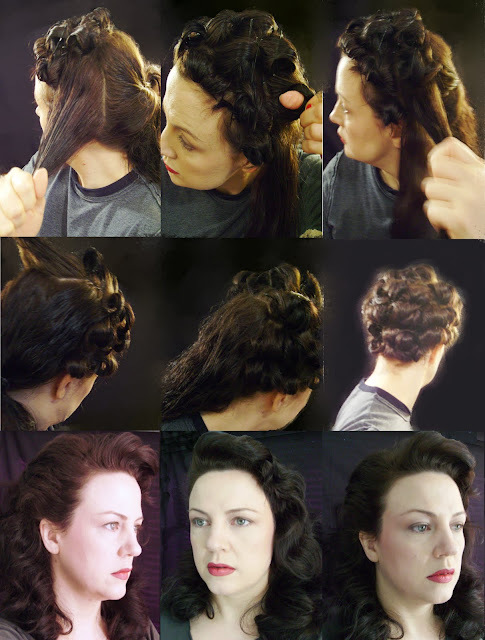 I used to set my Grandmothers hair all the time, so I thought I'd share some pin curl skills for those who would like to have an authentic 'era correct' style. 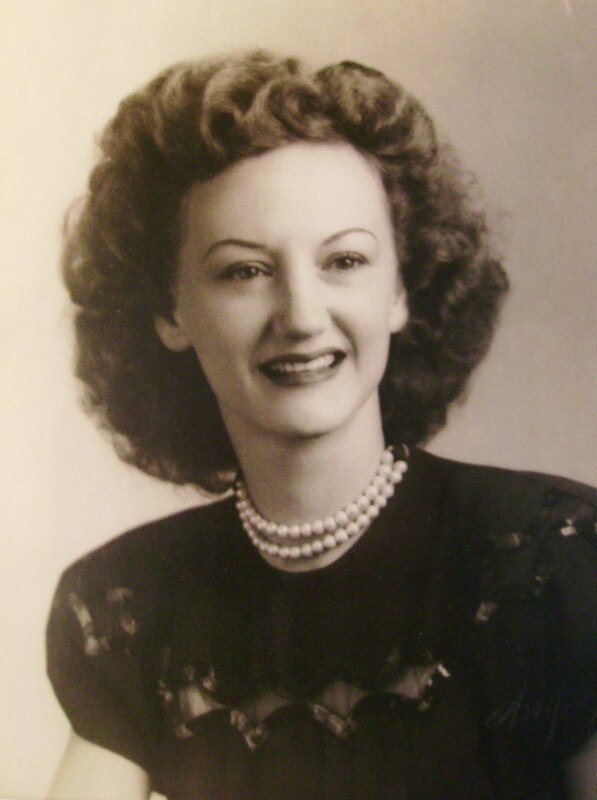 Just so we are all on the same page lets review a few examples of what hair was really like during WWII. Now do any of these ladies look like they have created a candy crunch net of hairspray over their entire head? No. Their hair is soft undulating waves of brush-able inviting locks that lasted for days without alot of product. Now I will show you how to do the same thing. Click on the images below then click again to zoom in to read the type. I keep a spray bottle of water on hand to keep my hair damp as I roll it up. I do not use any product at all just shampoo. No setting lotion, no hairspray, no conditioner. Conditioner just weighs my hair down and reduces the shine and actually makes it dirty. Your hair [my hair anyway] will stay clean longer with out it you know. After three days my hair still smells freshly washed. Hairspray will make it stinky also so use as little as possible. I know ladies! "Comb out my hair with no conditioner!!! Well I've Never!" But the end result is soooo worth it, unless of course it's so processed that it becomes rubber bands when wet. Just try it and be patient and gentle, try a really large toothed comb to do it, starting from your ends and gradually working your way up to your scalp not the other way around. 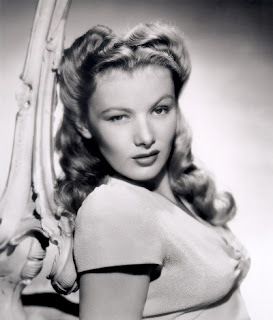 If your going for more of a Veronica Lake look with shiny large finger waves, I'll do a post on that later, her hairdo is simple. 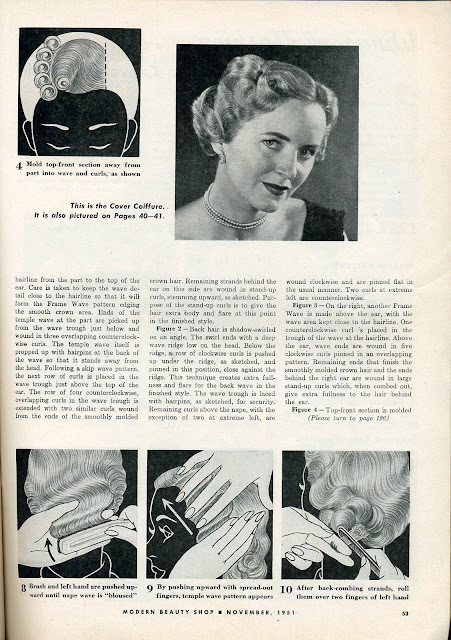 This article is in reference to a particular hairdo in '51 but the concept is the same, controlled brushing and sculpting of the waves over your hands or fingers. 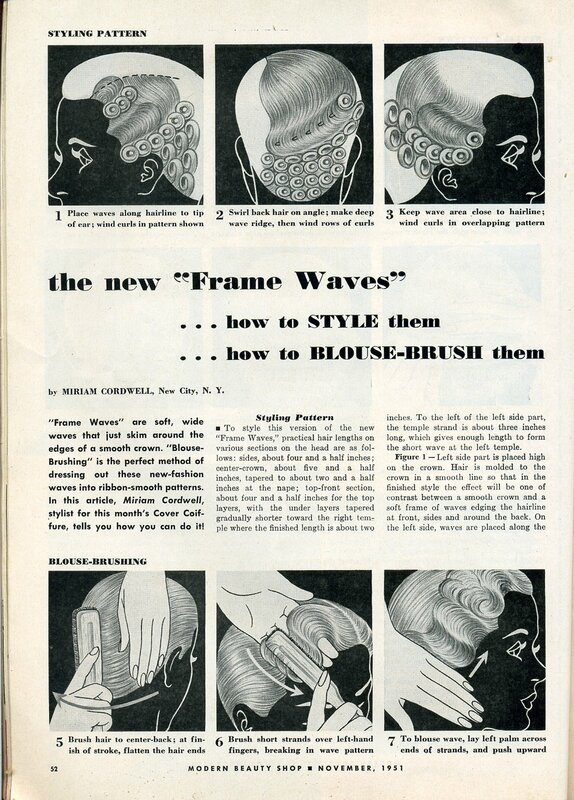 Guiding the waves into place, not just brush brush brushing out so you have a halo of frizz. It's really important that you use blouse brushing or a controlled method of brushing out your curls other wise you are going to get massive frizzy volume. Also if you use product such as setting lotion or gel, use your hands and fingers to break up the set so the curls soften prior to brushing out. Your hair must be absolutely bone dry! If you take your pins out and your hair is slightly damp your curls will fall out. I use a dryer bonnet that I made that I attach to my hair dryer. It takes 45 min's to 1 hour. You can let it dry over night but I would advise covering your pin curls with a scarf so you don't knock out your bobby pins in the night. 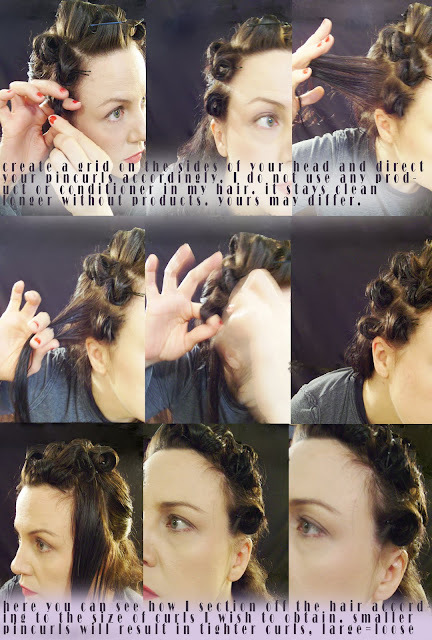 Finally after I initially brush out the pin curls I rake my fingers slowly downward in a pulling motion and arrange the waves and curls as I would like them to fall. 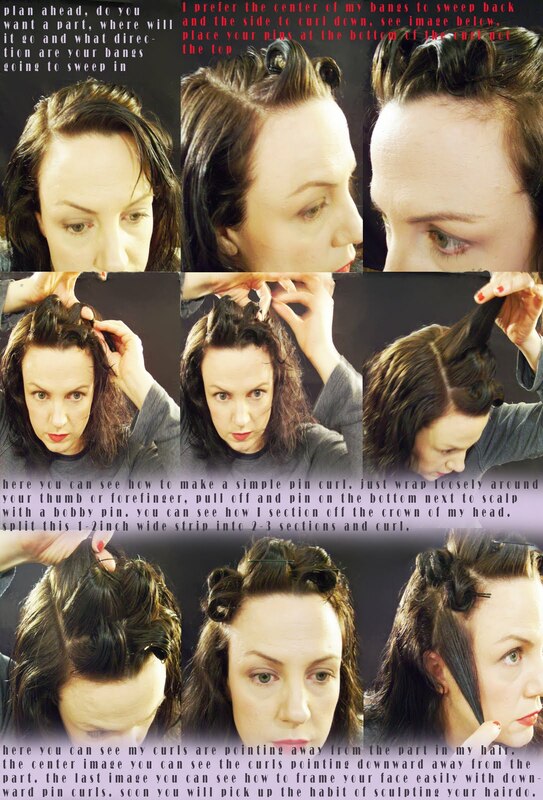 This will rid the frizz and huge volume you get from brushing out pin curls. Hi Ladies, I've been thinking about all you gals who just don't have the time to do a full curl set like this. I have a few other methods in mind for you and will do a post for you soon. If any of you ladies out there know of a conditioner or hairspray that truly leaves your hair clean for days I would really like to know about it! Please tell us in the comment section. I'll keep an eye out. Thanks. As a relative mouse who thinks things but is too chicken to say them, I just have to express my admiration for you. Spectacular! It's so true, though. Call it a "new" (multi-derivative) style...whatever...it's cool and all. But don't pretend historical authenticity. Specifically, the cat-eyeliner thing has always puzzled me. Not that I don't do it myself...but I always feel guilt at its potential anachronism. It's the folks with real historic knowledge (i.e. girls like you...and beautyisathingofthepast, etc) and scholarly intent who give us any chance at all of not letting these style ideals fade away...or just assimilate into bastardization. Looking forward to reading more more more! I'm glad to see I'm not the only one out there who has an eye for detail and accuracy. But in the interest of keeping this blog on topic I decided to remove my VIPER SPITTLE. LOL! Sorry! Otherwise it was quickly developing into something that was, um shall we say politely... "NOT ON TOPIC"
Thanks for your input Renee, I appreciate it. It's nice to see the viewpoint of someone who has been doing this for a long time. Conditioner won't make hair dirty or smelly sooner or reduce the life of a set for everyone. I don't wash more than once a week and often not more than than once every ten days. I do use conditioner, but only on the length of my hair, concentrating especially on the ends. Extra moisture is sometimes needed, especially for those of us with longer hair. Thanks for visiting but as for "Conditioner won't make hair dirty or smelly sooner or reduce the life of a set for everyone." it does for me. That's why I quit using it. Wow- so beautiful! I've been trying to find a good tutorial for this kind of style, so I'm really glad I stumbled upon your blog! One question- how damp should your hair be when you start pinning it- like straight-from-the-shower wet, or towel-dried? I usually keep a spray bottle on hand and keep it damp, but not soaking wet, while I'm rolling it up. I love, love, love this helpful blog. I've bought a bunch of books, watched tutorials on yutube and even asked good old granny for some tips, but none of them have made the impact your words and pics have. I'm another one whose hair works so much better without product. I can actually go a week without washing my hair (as long as I'm not out sweating in the garden or working out) and like you said, the fresh, shampoo fragrance lasts for days! I recently died my hair this great Rita Hayworth red...it's gonna look so good with your pin curl do!! I linked your blog to mine, I liked it so much. I'm TryTamara...I'm a romance author, so you might not have anything in common with me, but Ill definatley keep coming back here, with my fingers crossed that you'll be sharing more of your great 40's hairstyles!! I'm so glad you found me! So I'm not the ONLY ONE who gets dirty hair from using product!? Shocking. I'm so glad to have found your site. I am going to be doing some educational work teaching children about the wartime home in the UK soon where I need to dress up. I'm going to take your instructions to my hairdresser so she can go to work. thank you! i love the hairstyle and thanks so much for the authentic instructions. you look a lot like your grandma (both beautiful) by the way. I haven't tried any older hairstyles yet. I don't have a lot of time for styling. I'm feeling kind of chicken and needed to do some research first. Shampoo recommendation: I only wash my hair 2-3 times a week and do not like a lot of products. they make my fine hair look greasy and force me to wash more often. I HAVE found that I like sulfate free and paraben free products, and especially the ones labeled organic- such as the organix brand, for example. hope that helps somebody. 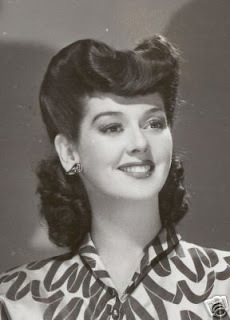 Rosalind Russell is your grandmother? Sorry - that's the way your blog is showing on my phone. Your line, "This is my grandmother" is just above Rosalind's photo. Then there is a picture of the lovely lady who seems to be the same as the lady in the banner at the top of the screen. THEN there is a Pin on Pinterest from this page, which is how I found your site. In it, she says "This is her Grandmother!" And shows Rosalind's photo. It's all rather confusing. Can you clarify? Secondly, I like your blog very much, more for the information you are providing than anything I can do for myself. Both my shoulders have been damaged by torn rotator cuffs. One several years ago (10?) by a work injury, and two unsuccessful surgeries six months apart, with a year of physical therapy that did not heal me enough so I could keep my career. The left was damaged in a fall six months ago, and due to the discovery of the return of a previously surgically treated heart condition when I went to the surgery center in August to have it repaired! So, due to long delays in treatment, which just got me out of a week in the hospital two days ago (yes, over Christmas!) I've STILL not had my shoulder fixed! And, because I know what the recovery period is like, I'm likely going to forgo that procedure. At my age, and now with the addition of several other disabling conditions I didn't have as bad the first time around, I think I'm just going to pass. It's a very intense program, and I'm now unable to drive, so would have to depend on others to take me and and bring me home. In any case, I can't hold my arms up long enough to do much with my hair beyond a quick blow dry. I have my hair cut quite short, and usually once I wash it and dry it quickly with a round brush and blow dryer, I'm done with it. Right now, I'm using Dove Advanced Hair Series Oxygen Moisture Shampoo that is designed for very fine hair, and doesn't weigh it down. Sometimes I use a little of the matching conditioner on it, but it still seems to weigh it down to the point where it seems to have no body at all by the next day. Shampoo alone, with soft water, seems to be just what the doctor ordered! Its got much more volume with just the shampoo. Of course, the cuticle of the hair is all roughed up, which seems to be what works best, unfortunately. Still need some root lift, but if I can stick with that then I'm good to go!